When we think of December, we think of sparkling lights on houses, the glow of a candle and the warmth of a fireplace making a room cozy. For young children, this can all seem a bit of a mystery, but a magical one. Like all other times of the year, the holidays are no exception to the amount of ‘whys’ a young child will ask. 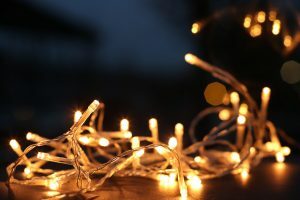 Why do people hang up lights? Why are we lighting candles? Why do people have their TV turned on to a channel that only shows a fireplace? Why do we make and give cookies? Why do people send us cards? Why do we go to a lot of parties? I was getting a lot of these questions. In a five minute car ride I could get the question, “why are there lights on that house?” at least ten times. And let me tell you, because they look pretty, is not an acceptable answer for a three year old, at least not mine! I was discovering, rather quickly that I was coming up with a lot of vague answers that were not conveying the message I wanted to send to my very curious child. I wanted him to feel a sense of purpose and wonder with each question and I did not think I could put it into the words for him to understand. Until I remembered the words my mother said to me. Words she gave to me much more recently, but that I wish I had heard as a child. In our house we celebrate Christmas and Easter. It happened to be last Easter that I was having trouble trying to explain it all in a way that my two and a half year old would understand. I told my mom my frustrations, and not even three hours later, in my email inbox she sent the starting of a children’s book, that she has since finished (and we love), explaining both Christmas and Easter. In her book she explains that Jesus was born with the light of love and Easter was the day the light burst out of the cave because it could not be contained and was then able to be shared with the world. By making it about light and love I thought my mom had hit the nail on the head. These are concepts that my young child can wrap his head around and that I felt I could explain. While in the above context the light and love are coming from Jesus, I believe that the concepts are universal. It does not matter where you believe the light and love have originated, they can be explained the same way to our children. I tell my son that light is so important this time of year because of how dark it is. We need the light inside of us to shine bright to guide us through the long nights. Every time we see a house lit up or a candle glowing we can be reminded that we have a light inside of us that needs to glow too. That the physical lights are a reminder of the light inside of us. And that needs to be shared to grow. The more we share our light with each other whether it is by hanging up lights or lighting a candle, the bigger the light inside of us gets and the brighter it becomes. I tell him that we all have light inside of us, and that is what connects us all, which is why sharing light grows the light for both the person who is sharing and the person who is receiving. Much like the quote from Buddha, “Thousands of candles can be lighted from a single candle, and the life of the candle will not be shortened. Happiness never decreases by being shared”. This also accounts for why there are so many parties and family gatherings this time of year. So we can all gather together and share our light and grow a big, bright, cozy light for us all to shine together with and share with those around us. My son can share his light by being nice to others, helping someone who needs help or spending time with someone who may be lonely. He can also help with physical reminders of the light by helping decorate with lights or even turning on the Christmas tree lights. I convey to him that each sparkle of light and flame and each act of goodness and kindness, are what brightens us inside on these long, cold nights. Along with this season being a celebration of light, it is a celebration of love. The long nights of December require bright lights to glow inside of us, and the briskness of the weather leaves us needing to be warmed as well. I talk to my son about how this time of year we make cookies for loved ones, give and receive cards from family and friends, and we also give and receive presents. He is all about presents right now and acting as if it’s his right to receive these gifts. Which is why I am bringing the conversation with him to love. Love is what keeps us warm inside as the temperature drops and sharing it is what heats it up. We need to heat up the warmth of love to last us the whole winter. This is why there are presents; as a way to warm us up. Whether presents are from Santa or family or given for Hanukkah or Kwanzaa it should be recognized as the spreading of love at a time when we need so many reminders of the good in the world and need more ways to warm our souls. When we share our love by giving cookies, cards or presents our love grows and our warmth spreads. When we receive cookies, cards or presents our love grows too, but not just our own love grows. When we give or receive we are also helping others grow their love which is just as important. Helping keep others warm through the winter is a very special job that my three year old can help with. He is able to brainstorm with me about how we can warm up others and we can feel how it warms us up too. We sing Christmas carols to share our lights and make holiday crafts to share our love. Each piece and tradition of the season I pass down to my child I feel the light and love growing inside me and I can see it glow in him now too. I have made this season all about light and love with my child. We talk about ways we can grow our own light and love in us, but also ways that we can warm up and brighten others. Each piece and tradition of the season I pass down to my child I feel the light and love growing inside me and I can see it glow in him now too. This is the meaning of Christmas that I want to share with my child and light I want us to share with the world during this holiday season. Welcome! You are here because you are interested in child development and parenting tips for your baby, toddler, preschooler and young children.